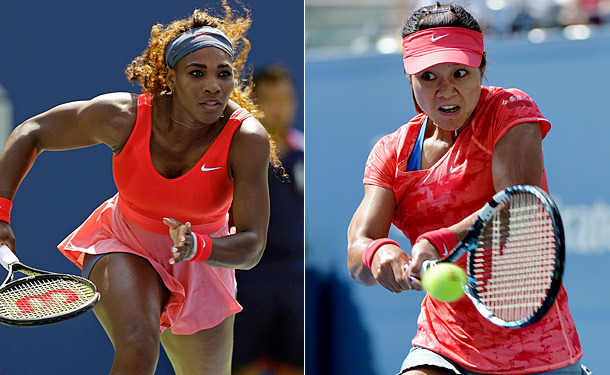 The US Open Tennis Women's Finals will be determined after the second match Friday afternoon between top seeded Serena Williams and number five seed Li Na. Victoria Azarenka has just beaten Flavia Pennetta in straight sets, so she will face the winner of this match for the title. You can find free online live streaming instructions and the TV schedule for this match below. Williams comes in an overwhelming favorite as her dominance in 2013 has carried her through to the US Open Women's Semifinals. Her record this year is an amazing 65-4 in match play and she has already won eight titles, a clip of one per month. That includes her 16th major crown victory that came at the French Open. No one has been able to slow Williams down during the US Open thus far. She has not lost a single set and has only lost 13 games thus far. More impressively, she dispatched of Spain's Carla Suarez Navarro in the quarterfinals without losing a single game. That feat had not been accomplished during the Women's quarterfinals since Martina Navratilova did it to Manuela Maleeva way back in 1989. She is on an amazing roll and showing no signs of letting up any time soon. China's Li Na is probably hoping she didn't pull Serena Williams in the semifinals, but since she did, she will have to first work on making the reigning champ drop a set before focusing on trying to win the whole match. Unfortunately for Na, her record against Williams is a meager one win to eight losses, so the deck is definitely stacked against her favor. Na is playing well this year and has already won a title and become a frequent face in the quarter or semifinals of many other tournaments. Thus far in the US Open, she has served up more aces than any other women's player with 29, so Williams better be quick on her toes when those blistering serves come her way. Serena's dominance over Na historically combined with how well she's playing right now should put the champ back in the US Open Finals, though Na is expected to give Williams more competition than she's faced in the tournament thus far.